Recently, the National Academy of Engineering announced fourteen Grand Engineering Challenges for the 21st century. Take a look, it’s a good list—promoting environmental sustainability, human health, and information technology that empowers people. But the last item on the list was most compelling to me—engineering the tools of scientific discovery. As a science teacher in a public high school, I may not have access to the funds to purchase all the scientific instruments I need. Wouldn’t it be nice to build these instruments for less? And as a genetics teacher, I’ve seen how innovative instruments, like robotic sequencing machines, have accelerated the study of the genomes of many species. Progress in sequencing methods has even outpaced Moore’s Law. How can we train the next generation of engineers to create the tools that enable scientists to better understand the natural world? One answer is to inspire them to envision such projects, and give them the tools to complete them, at younger ages. Open source tools, like the Arduino, are valuable in this effort. Arduino is an open source microcontroller for prototyping electronic devices. It can be connected to a wide array of inexpensive sensors to collect data. These data can be saved to an SD card, passed back to a PC, or uploaded to the cloud for further processing. An Arduino can actuate motors, creating scientific instruments that move as well as sense. As Massimo Banzi, co-inventor of Arduino, showed in his TED talk, middle and high school students can capably create scientific instruments with Arduino. 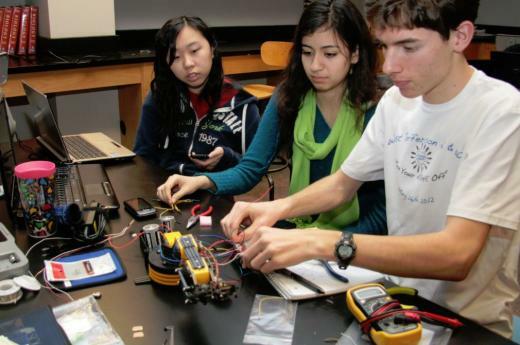 He gives examples of students who have created earthquake sensors, pH meters, and a wide variety of robots. In our classroom, students have hacked robotic arms, created new human-to-game interfaces, added sensors to a car, and developed a wearable air pollution monitor that crowdsources ozone levels across a city. Now, I’m a trained biologist, not an engineer, and prototyping these devices can be technically challenging. Fortunately, I did not need to guide students every step of the way in their project development, because the open source community had already provided examples, Arduino code, and documentation to get them started. Students were able to take existing code, modify it, and extend this prior work with their own creativity. I consider Arduino as an ideal teaching platform. It requires students to learn to write code, but their code will do more than move pixels. Their code will animate devices in the real world, devices that sense and move, devices that help us learn even more about the real world. "Many a live wire would be dead without its connections" is a favorite aphorism. To build our projects, we used Google ADKs, generously donated by NCSSM alumni at Google. These are modified versions of the Arduino Mega and Due boards. Google has been a long-time supporter of open source technologies. After a few weeks of prototyping, students had working devices! After a quick call to the TSA, to let them know that we were bringing weird devices with wires and circuit boards onto the plane, students presented the projects to Googlers in Mountain View. Recently, members of our faculty were asked to create a engineering-focused curriculum for North Carolina funded by the Race to The Top program (economic stimulus dollars at work!). My part of the work was a series of new Agriscience and Biotechnology courses. While reading about the various ways that automation is driving improvements in agriculture, through the use of robots, drones, wireless sensor networks, and greenhouse controls, I realized that each of these technologies can be automated with Arduino. Moreover, Arduino is actually used to develop prototypes for new generations of these devices. Clearly, this is a great time to train today’s agriculture students to develop for Arduino. The NC School of Science and Mathematics’ agriculture curriculum, along with curricula in other disciplines, is Creative Commons-licensed and open for all, online. Take a look. This year I have begun to train fellow teachers and community members in the use of Arduino, and I hope to recruit another group of students this year to initiate agriculture projects in greenhouse automation, wireless sensor networks, drones, and robotics! Our goals are simple—grow more food with less. By less, I mean less water, fertilizer, pesticides, and tillage. Each of these inputs is expensive and each has some negative environmental consequences. Precision agriculture—powered by open source technologies! I like to say that teaching is open source—we teachers share lesson plans, presentations, and activity guides all the time. Older teachers help younger teachers with archives of this material (and younger teachers help older teachers with fresh ideas and up-to-date technology skills). Open source tools are a great fit for education—they are free, sharable, open for exploration and hacking, and most importantly, backed up by strong communities of users. The community of Arduino users has taken this small open source board, with its open source IDE, and CC-licensed code and documentation, and have created a versatile prototyping platform that can help realize the last of the engineering grand challenges—engineering the tools of scientific discovery. If you are a science teacher that is in need of new instruments, consider making your own. The open source community is here to help. Wow! Excellent to see what NCSSM is doing, in so many ways! The education program, the students, the challenges, the public benefits possibilities...they are firing on all cylinders! Thank you Michael-- stop by and visit NCSSM anytime! Hello, Jon. I love seeing people make open source lab instruments. Sometime these devices aren't just more affordable, but also more functional. For niche equipment you either have to shell out the big bucks or try making it yourself, which is often good enough. I recently founded Pax instruments (http://paxinstruments.com/) to make open source lab instruments. I just launched my T400 temperature datalogger on Kickstarter (https://www.kickstarter.com/projects/1880050573/pax-instruments-t400-tem...). I'm pretty excited to ship the first of what I hope to be many open source lab instruments. Thank you Charles and good luck with the kickstarter. I passed along the reference to all my friends and colleagues. I remember programming old Campbell Scientific dataloggers to collect data in the field in graduate school that must have cost thousands.